If you're looking for a pair of incredible-feeling logger work boots, look no further. Traditional loggers are heavy, bulky, and inflexible, but these Danner Men's EH 15437 Waterproof Brown Composite Toe Insulated Logger Boots are lightweight and allow your feet ea ... (see full details) (see specifications) #15437. If you're looking for a pair of incredible-feeling logger work boots, look no further. Traditional loggers are heavy, bulky, and inflexible, but these Danner Men's EH 15437 Waterproof Brown Composite Toe Insulated Logger Boots are lightweight and allow your feet ease of mobility. Plus, they’re still just as strong and durable as the clunky loggers you're used to wearing. This men's footwear features composite safety toe caps for your protection, plus waterproof exteriors and insulated interiors to keep your feet warm, dry, and comfortable. In terms of the outsole, you'll receive lightness and protection in this men's footwear. The outsole is the Vibram 360-degree Logger style. It provides significant edging and traction. This pair also features a 90-degree heel, which makes climbing in and out of equipment easier. Plus, if you're on steep terrain you'll scale it with little to no difficulty. Finally, the outsole is able to keep you safe from electrical harm. It meets the standard ASTM F2892-11 M I/75 C/75 EH, which means you'll have composite safety toe caps guarding your toes against impacts and compression. You'll also have the protection that comes from the electrical hazard rating. The rubber outsole is capable of protecting you from electricity. The lack of a metallic toe makes these lightweight. Their non-metallic, composite toe does not transmit heat or cold like traditional steel toe boots. With these Danner logger boots, it's all about the construction, so let's talk about the craftsmanship that went into them, starting with the upper and the insole. The upper is made from Nubuck oiled leather. It's a top-grain, velvet-like Nubuck rubbed in oil to improve its water resistance. It's a tough leather, but it takes less time to break-in, so these men's composite safety toe boots have that comfortable, all-you feel in less time. The inside of these brown boots is lined with 400G Thinsulate Ultra, which is a high-performance insulation that keeps your feet warm in cold weather. The insulation is incredibly effective, but it's also light so as not to hold you down. The insole features an OrthoLite footbed for cushioned comfort and prevention of exhausted feet. 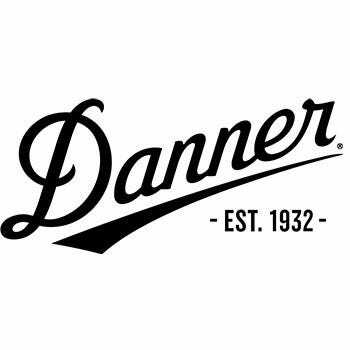 It also features a Danner Dry liner, which is a 100% waterproof barrier that allows moisture like sweat to escape while keeping unwanted wetness out. Another reason these waterproof boots are so lightweight also has to do with their craftsmanship. The midsole is combined with the Bi-Fit shank and lasting board to form one single unified piece. Placing all three into one makes these waterproof brown boots immensely lighter while not sacrificing the support you want in a pair of men's work boots. While we’re discussing support, it's important to note that these composite toe boots are handcrafted with Danner's legendary stitchdown construction. It offers increased stability beneath your foot and a wider platform to stand on at all times. We've said how these insulated boots are so light, but we haven't said just how light they are. These brown-colored loggers are 8 inches tall and weigh only 75 ounces per pair. Toss away those old, clunky loggers and get these lightweight yet strong Danner Men's 15437 Brown Composite Toe Insulated EH Waterproof Logger Boots ordered today - right here at Working Person's Store today. I have lived in a pair of Danner boots while deployed to the "sandbox" serving this great nation. I loved these boots as much as a man can love boots. Now, as a civilian, I work in the petroleum transport business. I am extremely hard on boots. I NEED boots that are waterproof and insulated during the winter months. These do not leak and are adequately insulated but my feet sweat and get cold immediately. There is a "membrane" in these shoes that does not breathe. Comfortable yes. These shoes will make you very, very sad if you are expecting to go back and forth indoors to outdoors. Danner Boots: Men's 15437 Brown Composite Toe Waterproof Insulated EH Logger Boots is being added to your cart.